If you die down there, you're welcome to share my toilet. (SPOILERS) More of the same really, continuing Chris Columbus’ unswerving mode of following Steve Kloves’ sticking like glue to JK Rowling’s early structural template. Another mystery on the Hogwarts premises (you’d have thought the teachers would try to keep the kids clear of mortal peril until they’d at least graduated) that inevitably ties in to Voldermort. It’s marginally more honed this time, though, which means that when Harry Potter and the Chamber of Secrets – even the title is eminently resistible – finally knuckles down, it flows better. Unfortunately, it also has several major red flags to contend with. Dobby. Sure, he’s supposed to be annoying, I know. Gollum by way of Jar Jar Binks. But did he have to be so wretchedly designed (not remedied by house elves of later instalments)? 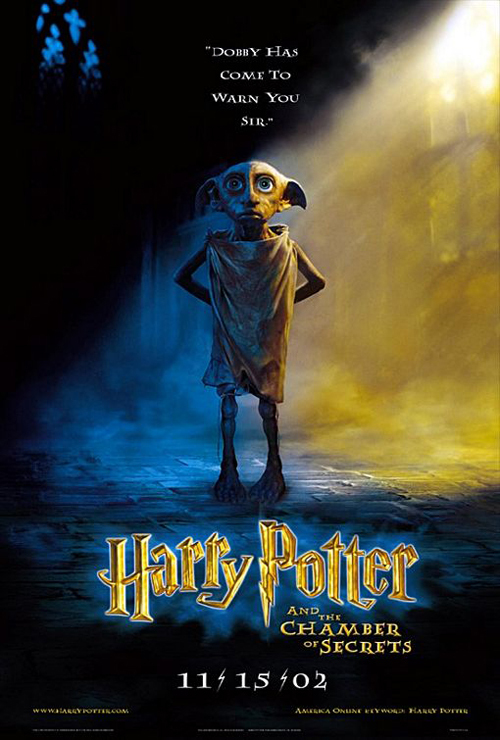 Some of the CG in this film is pretty good (the Basilisk, for one, and the flying car for another), but Dobby is never more than Smeagol-lite in attributes. Toby Jones voices him with duly pathetic dedication, but a fitting end would have been to have the elf’s head shoved in a blender, rather than being granted release from service to Lucius Malfoy. It’s also a considerable problem how unwarrantedly long this movie is. Does it need to be pushing towards three hours, particularly when you could happily lose most of the first 40 minutes and barely notice? Doubtless Harry will be redone as a Netflix TV show at some point and at such a time this will seem positively spry, but as it is, the only verdict can be guilty as charged of indulgence in the first degree. Exhibit C is Gilderoy Lockhart, the Frank Spencer of the wizarding world. It’s a decent performance from Sir Ken, much breezier and possessed of a light comedy touch than his recent Poirot, but the character beggars belief. Are we really to believe that a narcissist celebrity wizard is venerated by other wizards despite being patently inept at every turn? Why does he continually volunteer to perform spells in front of his peers if he knows he’s terrible at them? JK must have at least considered this point, as at one point Gilderoy imparts that the only thing he is (conveniently) any cop at is memory charms (by means of which he stole credit for others’ achievements). Unless he was intending to perform one on the entirety of Hogwarts, though, it doesn’t really wash.
Countering that are several sterling additions, though. Jason Isaacs is magnificently composed in his malevolence as Lucius, and there’s an enjoyable scene (relatively) early on where he and Mark Williams’ Arthur Weasely cross paths. Very different characters and performers, but it’s a treat to see them bring that into play (likewise, it would have been nice to see more between Lockhart and Snape, so evident is the latter’s disdain for the former). Shirley Henderson’s Moaning Myrtle is also memorable. Nice to see Robert Hardy as the Minister for Magic too, who instantly seems like he’s always been there. I have to say, however, I find Robbie Coltrane’s “ever so ‘umble” giant-of-the-people serf irritating for the assumption we’re supposed to love him. That’s the class system for you. As with its predecessor, elements of the novel’s plot are rather lost in translation. The gist of the opening of the Chamber of Secrets is explanatory enough, and the reveal regarding Tom Riddle is reasonably sound; that, through the awesome power of anagrams, he’s a younger version of Voldermort attempting to manifest. But it entirely escaped me that Lucius (at least in the books) didn’t realise the diary’s properties when he stowed it in Ginny Weasely’s cauldron (apparently to rid himself of an incriminating dark object and bring Arthur into disrepute – which all seems bit thin). Perhaps Voldermort should have been a touch clearer in his instructions. By and large, Chamber of Secrets is amiable but very forgettable; it’s never a good sign when the most annoying elements (Dobby, Gilderoy) are the ones that stick in the mind. There is, fair’s fair, an amusing sequence in which Harry and Ron transform themselves into Slytherin boys in order to find out what Draco knows, but there’s also another of those quidditch games to get confused by. And Rupert Grint’s still streets ahead of the other juniors performance-wise at this stage, with Emma Watson’s rather over-emphatic delivery leaving her trailing a distant third. 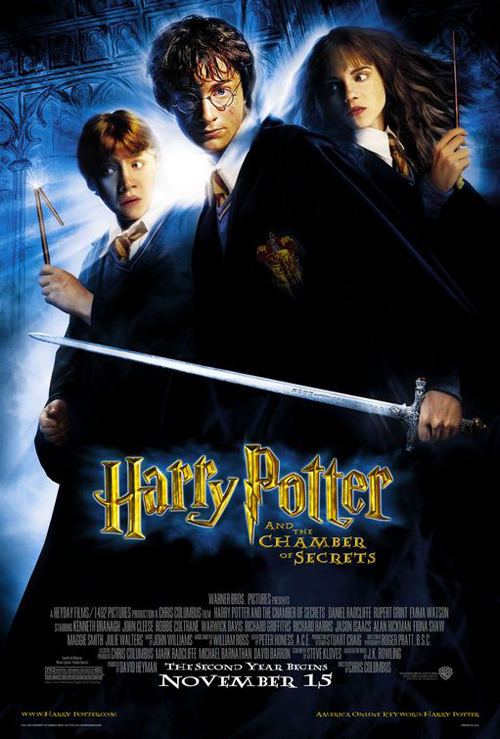 So Harry Potter and the Chamber of Secrets was Columbus’ last real involvement with the series (he retained a nominal producer credit); after this, the results would be universally more engaging and less sugar-coated (Columbus would try his hand at Young Adult again with Percy Jackson, but his directing career has been noticeably subdued since). Also Richard Harris’ final appearance as Dumbledore, sadly. The first two entries are much as I remembered them, undemanding, overly beholden adaptations that give non-fans little reason to invest themselves in the material. Fortunately, that would change in one fell swoop.